Never get involved with the client. That’s one of the first rules of the business, and a rule Con has never had trouble following. Until Maggie walks through the door. She smart, charming, isn’t impressed by his family, and doesn’t care that he’s trans. If anyone is worth breaking rules for, it seems to be Maggie. But things that seem too good to be true often are, and Con soon finds himself caught between his family, Maggie, and figuring out what really matters most to him. It’s difficult for me to rate short stories well. The whole problem with short stories is that it’s hard to put so much into such a little space. And for me, this story suffers for it. There is a lot that seems to be missing with the legal part of the story, especially in the last part. We went from a cursory investigation in part one to a bit more depth in part two to skipping over most of all of the build up for the court case in part three. For me, the case is an integral part of the story, so having the resolution of the case be a whole “oh, we won, that’s so great!” without telling me how they won was not satisfying at all. Next, I’m not sure I get Maggie’s attraction to Con at all, especially when I find out that it was all initially contrived as a way to ensure Con’s attention on her court case. I’m not sure I could be as forgiving as Con seems to be and lying is definitely not a good thing to have as the base or start of a relationship. Is Con’s desire for acceptance of who he is so big that he can overlook her blatant attempt to use him? Add in the way her parents and his threaten him into not dropping the case and I’m not sure how he ever gets past the way they met. I liked the concept of the story, and I love how applicable the title is, but for me, it missed in the execution. It may have been easier to work these issues out in a longer format, but the issues for me aren’t nearly resolved at the end of this story. 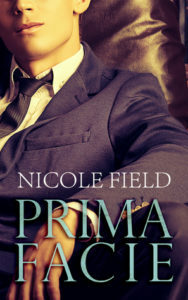 Nicole writes across the spectrum of sexuality and gender identity. She lives in Melbourne with her fiancee, two cats, and a bottomless cup of tea. Also likes candles, incense and Gilmore Girls.